Dots Dashes Doodles & Dreams: Too-wit! Too-woo! I love , love, LOVE this card! It was made using two of my current favorite things: Card Candi from Craftwork Cards and the second of my Martha Stewart Round the Page punches. An owl shape was cut from a piece of blue/green tartan-ish paper and pale blue Stickles was used to go around all the edges. A white scalloped circle was glued onto the centre of the owl and a small blue triangle was cut for the beak. The owl was then glued to a piece of blue card measuring 6.75 inches which had been punched with the MS round the page punch. 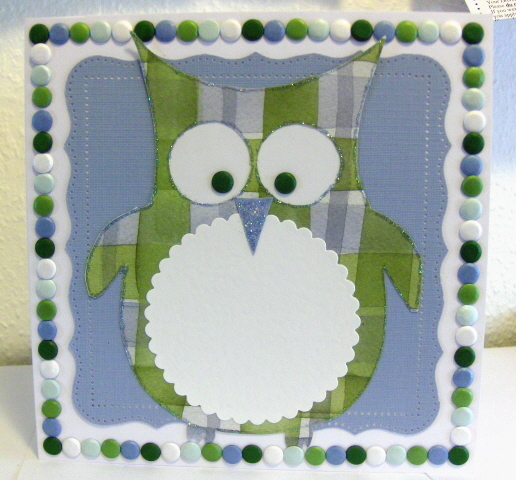 The topper was then glued onto an 8 x 8 square card from Craftwork Cards. Co-ordinating Card Candi was then attached around the edge using small squares of 3d foam. Card Candi was also used for the owls eyes.